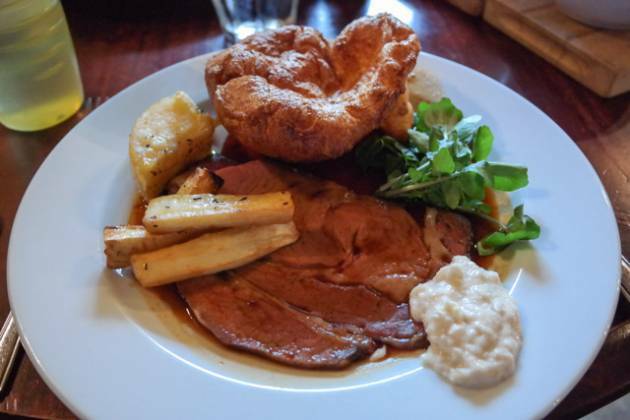 We were looking for a nice Sunday lunch in Tunbridge Wells, and decided on the Hotel du Vin – it’s been discussed at work and highly recommended. Very simple to reserve – I just gave them a call a couple of weeks before, and booked a table for 3 people at 12:30. I’m pleased to say they had a car park – albeit quite small. It meant we were able to park next to the venue, whereas otherwise it could have got into a game of “hunt the parking space” – especially in Tunbridge Wells. 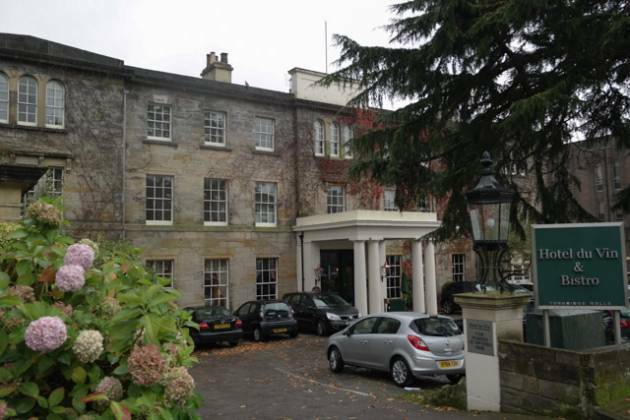 The venue outside was impressive, perhaps an old manor house? Upon entering, we walked through the reception area to the restaurant, and shown to our table in the corner. A high chair was brought over for our son, who was 22 months at the time. It was an old, atmospheric room, being subtly lit and with lots of pictures related to wine – it felt like a high-end “bistro”, which I imagine was the aim. The tables were laid out with linen napkins. We were quite boring today and ordered sparkling water for the table. 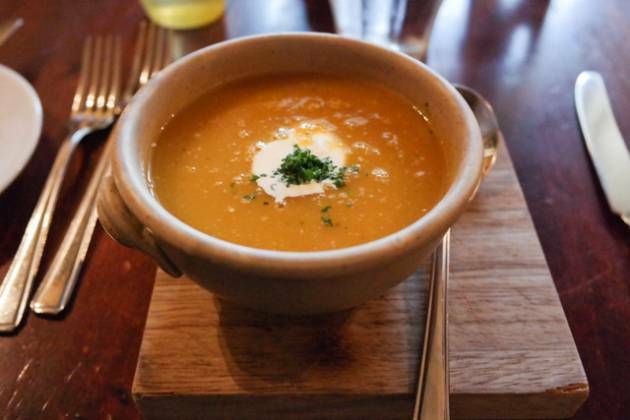 We were asked if we wanted the spiced pumpkin soup to start, along with the market table – I said “definitely”! Claire declined… Soup was brought out quite quickly and was delicious! I then started with the superb selection of treats available on the market table – cured meats, salmon, salad and various other things. 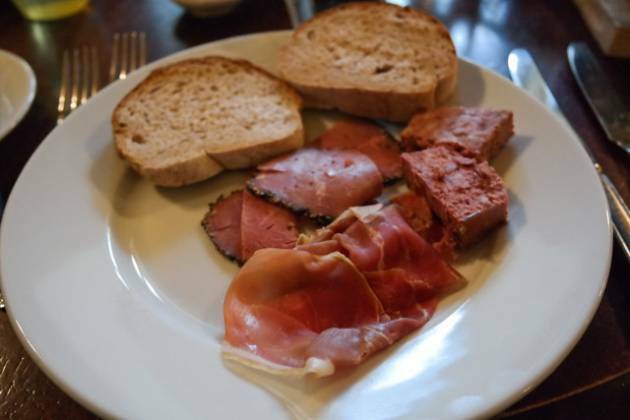 I chose some wild boar and venison pate, along with beef, ham and bread. Claire went a bit healthier! For JW, our son, we asked if they could prepare just some fruit for him to nibble on. I ordered the beef, Claire and JW both had roast chicken. The plates had the meat, yorkshire pudding and some greens, along with the gravy (Claire also had some stuffing). Separately served were roast potatoes, cauliflower cheese, roast parsnips, carrots and broccoli. The 2 slices of beef was delicious, cooked rare and very delicate. Claire enjoyed the chicken supreme. 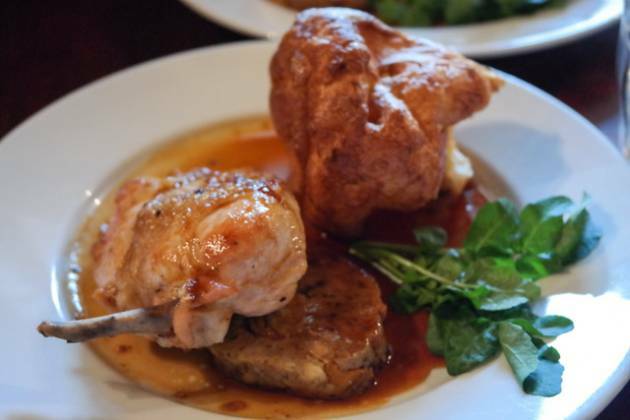 The roast potatoes were perfectly cooked, as was the yorkshire pudding. The cauliflower cheese was a welcome addition, just needed to be cooked a bit more on top (for my liking – ie burnt!) – the other vegetables were excellent. 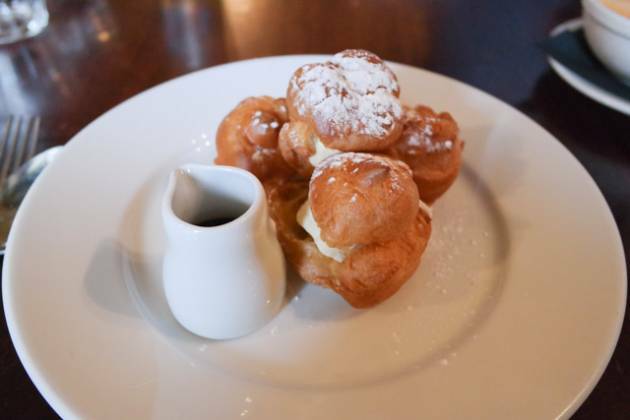 Claire asked for the chocolate profiteroles – they were almost frozen inside. 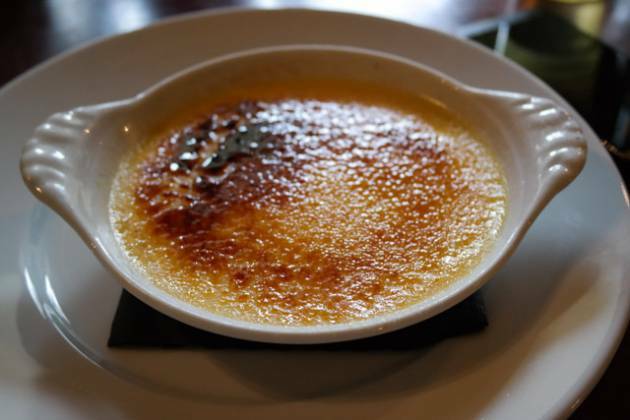 I ordered the creme brulee, which was nicely caramelised on top, and an even distribution of vanilla pods. JW was happy with his fruit salad. We also ordered coffees – a cappuccino (at £3.75) and an americano (£3.00). The highchair was clean and in good repair. The staff were very welcoming with JW, helping us be quite relaxed. The baby changing facilities were also in good order. 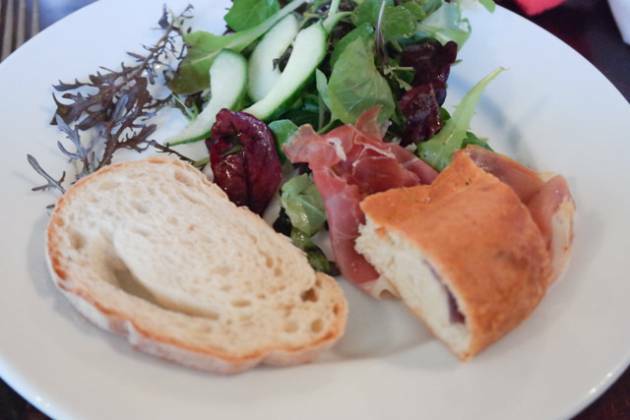 It was nice they catered for children, providing the same food as adults – £9.95 for 3 courses. We had a nice walk around their small garden afterwards. So, definitely suitable for families. 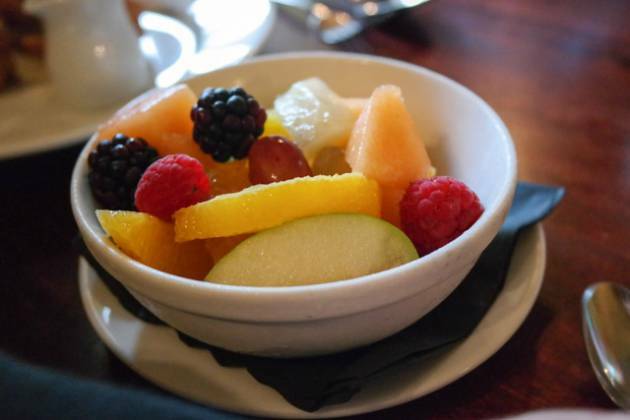 I had high hopes for Hotel Du Vin, and they very much lived up to them. The venue was smart, as was the service. The meal actually worked out good value, there was so much food and the quality was, on the most part, excellent. Slight disappointment with the profiteroles being almost frozen, but this didn’t put a dampner on the experience as a whole. 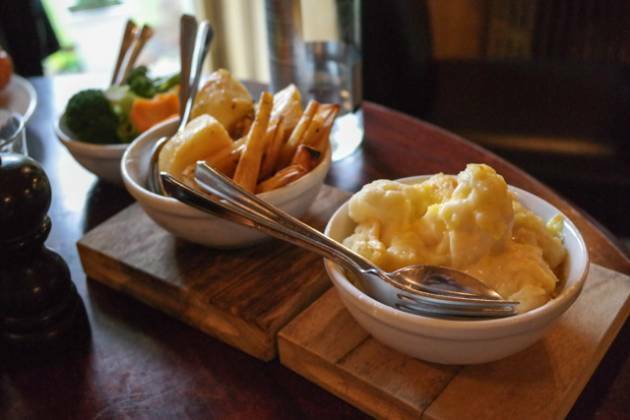 The Sunday lunch was very enjoyable, and they served cauliflower cheese! I’d say the cappuccino was a tad expensive at £3.75 though. Overall, a great experience and a well deserved Top Rated award for Hotel Du Vin in Tunbridge Wells – recommended for family celebrations!